You may be familiar with Flud as the news reader app that’s trying to build an appealing alternative to Flipboard and Pulse. Flud launched iOS platform back at the end of 2010 with a heavy focus on design — and a simple user interface. Fast Company even gave Flud the 2010 Design Award of The Year. The startup has since launched its social news sharing app on Android, raised $1 million in seed from Ludlow Ventures, Scott Belsky, and Detroit Venture Partners, and is re-tooling its app for Mango, as Jordan reported last month, for release in January. It’s been off to a great start, but to really offer a service that competes with the big boys, Flud is on a mission to build a personalized news-sharing ecosystem. Today, the startup is adding some important functionality into its app in an effort to do just that, as Flud 2.0 now allows users to create and broadcast their own news personalities. So, in addition to being a social tool for users to discover news content and select the news and information they want to follow, users can now share inside Flud to an audience based around topics or interests, creating news personalities by curating content they find from their go-to daily news sources — and receiving their own personalized Flud URL (www.flud.it/rip-empson), for example. How often do you see a headline but don’t have time to read the article and want to save it for later? Flud 2.0 offers controls for sorting and organizing news sources, allowing users to read news quickly, gather headlines into “Reading Lists”, to read later at their leisure. The Reading List button allows users to quickly bookmark articles when scanning headlines, which pop up on their profiles and can be checked out by their followers in users’ activity feeds. Pretty cool. Flud has also added a “Share” button so that readers can push content to social networks, in conjunction with the ability to create news networks — or communities — around particular areas of interest. 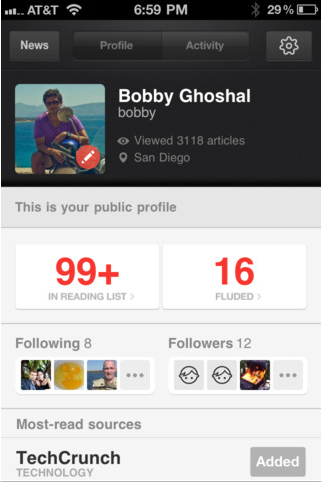 Through these new social capabilities, Flud users can create profiles, which become their personal front pages, compiling news that matters — essentially becoming a diary of what users are reading that can be viewed (and interacted with) by other readers. Flud has also added support for Tumblr, allowing users to push content to their blogs for furhter discussion, adding support to Google Reader, Twitter, Facebook, and Instapaper, as well as syncing across devices so that their personal news diaries can follow them across devices, tablets, and desktops. These new iterations are an important move for Flud in moving from an app model to a platform model, as it’s one thing to build a suped up news RSS aggregator, but another to give users a dynamic platform through which they can interact, share, and converse with a community of news readers — and the content itself. With information overload and a colossal amount of content and news circulating on the Web, most readers browse through headlines looking for content they want to share. The ability for Fluders to create reading lists, use the Flud equivalent of “liking” headlines and stories which then show up in their activity feeds and can be viewed by those following their profiles, makes Flud into a news equivalent of Facebook or Twitter. Your news profile shows how many stories you’ve read, which stories you’ve “liked”, what content is in your reading list, and what readers and news sources you’re following. It’s a great way to discover news from sources you trust, as well as give others the credit for influencing what articles you’re reading. If I read a story that you’ve Fluded, my profile will show that you were the source that allowed me to discover the article. Many of use Twitter to discover news items that people are sharing and reading in realtime, but Twitter is filled with noise and that discovery has to be serendipitous. Flud takes the better parts of Twitter’s news discovery and gives them their own news-dedicated community, with some great added social benefits. The more you read, and the more you influence others, the higher you rise as an influencer — something you can bet Flud will continue to focus on in the future. These capabilities add a new level of discovery and curation to Flud’s service, one that should be appealing to its users and help push the service along in its mission to go beyond RSS to achieve that ecosystem feel that readers want and are coming to expect. For more on Flud 2.0, you can find the app here or at home here.